The father grew up with church being part of his life. Over time, he withdrew, so the son grew up without church. While attending during college, church become part of the son’s life. In time, he became a pastor and a professor. As one would expect, father and son would have religious discussions, and many went nowhere. Eventually, the son invited his father into an honest dialogue through written letters – and the father agree. Their format was simple – the father asks a question, then the son answers. As with any meaningful dialogue, answer lead to more questions. 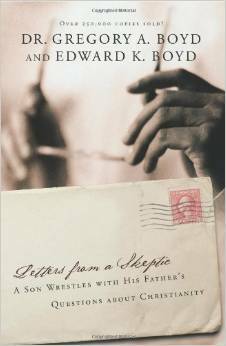 Letters to a Skeptic (Gregory Boyd and Edward Boyd) is the collection of letters of such a journey. The father (Ed) asks good questions, and provides thoughts around his questions. Ed’s responses to his son (Greg) are also direct, poignant, and relevant. Greg’s replies are respectful and (generally) easy for a layman to understand. However, the responses are also debatable within the Christian community because one size does not fit all. Are the Gospels full of contradictions? Isn’t the Bible full of myths and God’s vengeance? The discussion between father and son is sincere, respectful, and thought-provoking. Every Christian won’t agree with every point made by the son or the father – let alone by others in a discussion group. After all, theological disagreements exist with Christianity. This book enhanced my Christian perspective, it also caused me to question the thoughts said by others – yes, the others in my own church – and that’s OK. In the end, reading and discussing Letters to a Skeptic was worthwhile – therefore, I recommend this book for those who might be interested in learning more. Religious choices are a personal decision. Although I’m a regular church attendee, I try to be respectful to all. Enjoy, visit as many as you want, and I hope you comment on the post you visited.